 No power, small size, convenient to carry, good insulation effect.  Reusable ice gel pack with long cooling time,3 times effect better than ordinary ice cubes.  Cooling gel is non-toxic, odorless, non-corrosion and the thaw melts without pollution. ✅Features: Small size, convenient to carry, shockproof, anti-press and with good insulation effect. Very suitable for insulin refrigeration. High-quality Aluminum foil liner designed with velcro. Better to maintain the temperature and place drug. ✅Multi-layer Design: there are thermal insulation course, storage layer, buffer layer. 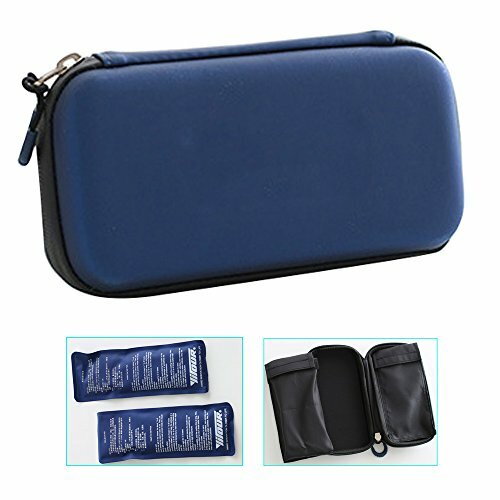 It is convenient to put the cooling gel into the inner pocket, keep the ice bag separate with insulin, better to keep the temperature for your insulin. ✅Reusable Ice Gel: The ice gel pack is reusable and with long cooling time. its cooling effect is 3 times better than ordinary ice cubes. And the gel is non-toxic, odorless, non-corrosion, the thaw melts without pollution. ✅Cooling Time Lasting: It can keep cold for 6-10 hours between 2-8℃ with colder gel-pack and keep cold for 1 days at 25℃ with colder gel-pack. No matter where you are, on the train, in the car, it is very portable for you. ✅Service Guarantee: Your satisfaction is our priority. Please contact us first when you have any problem, we will give you the best service and solve the problem ASAP. Thank you so much.